Why isn't NewContextFromHierarchy working as it should? Now I want to search through the table until I find a parent object with a specific type (I don't know how many parent objects my have start object). For example I start with ID 123 and want to find the ID of the parent object with TYPE site. How can I solve this with SQL? If you're not interested in finding the complete path between the two nodes then remove the where clause from curr and add WHERE TYPE = site at the very end. Or am I misinterpreting it? The following code works in Oracle SQL Developer CLI 17.2, but not in 18.4. In 18.4 the substitution for the && doesn't seem to happen. I am doing this on two different machines, so it is possible that I have a different setting on one, but I compared and didn't see any differences. UPDATE: I did install Oracle SQL Developer CLI 17.2 on my new machine and the code below works fine. So it seems like an 18.4 bug. Need a little help, I wanted to get the data from a certain table which displays entries with its unique invoice number and the date when it was Billed. however it does not accept the ORDER BY sort I needed. It force me to do a GROUP BY Clause which displays the same date for all of its result. how do I do it? I have a web URL it has Json data as shown on the image, I need to export the Json data from the web page into sql table by using ssis. I need some help please. 2019-04-22 19:16:13.67 Server      Setup step is copying system data file 'C:\templatedata\master.mdf' to '/var/opt/mssql/data/master.mdf'. 2019-04-22 19:16:13.74 Server      Did not find an existing master data file /var/opt/mssql/data/master.mdf, copying the missing default master and other system database files. If you have moved the database location, but not moved the database files, startup may fail. To repair: shutdown SQL Server, move the master database to configured location, and restart. 2019-04-22 19:16:13.75 Server      Setup step is copying system data file 'C:\templatedata\mastlog.ldf' to '/var/opt/mssql/data/mastlog.ldf'. 2019-04-22 19:16:13.76 Server      Setup step is copying system data file 'C:\templatedata\model.mdf' to '/var/opt/mssql/data/model.mdf'. 2019-04-22 19:16:13.77 Server      Setup step is copying system data file 'C:\templatedata\modellog.ldf' to '/var/opt/mssql/data/modellog.ldf'. 2019-04-22 19:16:13.79 Server      Setup step is copying system data file 'C:\templatedata\msdbdata.mdf' to '/var/opt/mssql/data/msdbdata.mdf'. 2019-04-22 19:16:13.82 Server      Setup step is copying system data file 'C:\templatedata\msdblog.ldf' to '/var/opt/mssql/data/msdblog.ldf'. 2019-04-22 19:16:13.95 Server      (c) Microsoft Corporation. 2019-04-22 19:16:13.95 Server      All rights reserved. 2019-04-22 19:16:13.95 Server      Server process ID is 4120. 2019-04-22 19:16:13.95 Server      Logging SQL Server messages in file '/var/opt/mssql/log/errorlog'. 2019-04-22 19:16:13.96 Server      SQL Server detected 1 sockets with 2 cores per socket and 2 logical processors per socket, 2 total logical processors; using 2 logical processors based on SQL Server licensing. This is an informational message; no user action is required. 2019-04-22 19:16:13.97 Server      SQL Server is starting at normal priority base (=7). This is an informational message only. No user action is required. 2019-04-22 19:16:13.98 Server      Detected 1584 MB of RAM. This is an informational message; no user action is required. 2019-04-22 19:16:13.98 Server      Using conventional memory in the memory manager. 2019-04-22 19:16:14.14 Server      Buffer pool extension is already disabled. No action is necessary. 2019-04-22 19:16:14.27 Server      InitializeExternalUserGroupSid failed. Implied authentication will be disabled. 2019-04-22 19:16:14.28 Server      Implied authentication manager initialization failed. Implied authentication will be disabled. 2019-04-22 19:16:14.29 Server      Successfully initialized the TLS configuration. Allowed TLS protocol versions are ['1.0 1.1 1.2']. Allowed TLS ciphers are ['ECDHE-ECDSA-AES128-GCM-SHA256:ECDHE-ECDSA-AES256-GCM-SHA384:ECDHE-RSA-AES128-GCM-SHA256:ECDHE-RSA-AES256-GCM-SHA384:ECDHE-ECDSA-AES128-SHA256:ECDHE-ECDSA-AES256-SHA384:ECDHE-ECDSA-AES256-SHA:ECDHE-ECDSA-AES128-SHA:AES256-GCM-SHA384:AES128-GCM-SHA256:AES256-SHA256:AES128-SHA256:AES256-SHA:AES128-SHA:!DHE-RSA-AES256-GCM-SHA384:!DHE-RSA-AES128-GCM-SHA256:!DHE-RSA-AES256-SHA:!DHE-RSA-AES128-SHA']. 2019-04-22 19:16:14.33 Server      Node configuration: node 0: CPU mask: 0x0000000000000003:0 Active CPU mask: 0x0000000000000003:0. This message provides a description of the NUMA configuration for this computer. This is an informational message only. No user action is required. 2019-04-22 19:16:14.34 Server      Using dynamic lock allocation. Initial allocation of 2500 Lock blocks and 5000 Lock Owner blocks per node. This is an informational message only. No user action is required. 2019-04-22 19:16:14.36 Server      In-Memory OLTP initialized on lowend machine. 2019-04-22 19:16:14.46 Server      Database Instant File Initialization: enabled. For security and performance considerations see the topic 'Database Instant File Initialization' in SQL Server Books Online. This is an informational message only. No user action is required. 2019-04-22 19:16:14.48 spid7s      Starting up database 'master'. 2019-04-22 19:16:14.49 Server      Software Usage Metrics is disabled. 2019-04-22 19:16:14.71 spid7s      The tail of the log for database master is being rewritten to match the new sector size of 4096 bytes. 3072 bytes at offset 418816 in file /var/opt/mssql/data/mastlog.ldf will be written. 2019-04-22 19:16:14.91 spid7s      Converting database 'master' from version 862 to the current version 869. 2019-04-22 19:16:14.91 spid7s      Database 'master' running the upgrade step from version 862 to version 863. 2019-04-22 19:16:14.99 spid7s      Database 'master' running the upgrade step from version 863 to version 864. 2019-04-22 19:16:15.04 spid7s      Database 'master' running the upgrade step from version 864 to version 865. 2019-04-22 19:16:15.05 spid7s      Database 'master' running the upgrade step from version 865 to version 866. 2019-04-22 19:16:15.08 spid7s      Database 'master' running the upgrade step from version 866 to version 867. 2019-04-22 19:16:15.09 spid7s      Database 'master' running the upgrade step from version 867 to version 868. 2019-04-22 19:16:15.13 spid7s      Database 'master' running the upgrade step from version 868 to version 869. 2019-04-22 19:16:15.44 spid7s      Resource governor reconfiguration succeeded. 2019-04-22 19:16:15.46 spid7s      SQL Server Audit is starting the audits. This is an informational message. No user action is required. 2019-04-22 19:16:15.46 spid7s      SQL Server Audit has started the audits. This is an informational message. No user action is required. 2019-04-22 19:16:15.56 spid7s      SQL Trace ID 1 was started by login "sa". 2019-04-22 19:16:15.59 spid19s     Password policy update was successful. 2019-04-22 19:16:15.60 spid7s      Server name is '75d968b3f551'. This is an informational message only. No user action is required. 2019-04-22 19:16:15.64 spid21s     Always On: The availability replica manager is starting. This is an informational message only. No user action is required. 2019-04-22 19:16:15.65 spid8s      Starting up database 'mssqlsystemresource'. 2019-04-22 19:16:15.66 spid7s      Starting up database 'msdb'. 2019-04-22 19:16:15.66 spid21s     Always On: The availability replica manager is waiting for the instance of SQL Server to allow client connections. This is an informational message only. No user action is required. 2019-04-22 19:16:15.68 spid8s      The resource database build version is 14.00.3038. This is an informational message only. No user action is required. 2019-04-22 19:16:15.72 spid8s      Starting up database 'model'. 2019-04-22 19:16:15.96 spid24s     ERROR: Unable to set system administrator password: Password validation failed. The password does not meet SQL Server password policy requirements because it is too short. The password must be at least 8 characters..
2019-04-22 19:16:15.97 spid24s     An error occurred during server setup. See previous errors for more information. 2019-04-22 19:16:15.97 spid24s     SQL Trace was stopped due to server shutdown. Trace ID = '1'. This is an informational message only; no user action is required. 2019-04-22 19:16:16.03 spid19s     A self-generated certificate was successfully loaded for encryption. 2019-04-22 19:16:16.04 spid19s     Server is listening on [ 'any' <ipv4> 1433]. I'm used to two different conditions on the same data generated automatically by EF but only one different stack me by the performance LIKE 'blah%'(starts with) execute as well less than 1 second but when am I try to run LIKE '%blah' (ends with) this is run so much slowly - more than 40 seconds. Regarding this getting timeout exception by EF, etc. (I know how to extend timeouts) but I just need to know what the differences and how to prevent performance slow down in this small distinction. Maybe I am just not seeing something obvious but I don't understand why I am not seeing the results I am expecting. On lines 14-15 I am doing a join from ECITOfficerCertification and I would expect there to be an id of 1335 in the ECITDispatched field. There is a record in ECITOfficerCertification for EmployeeID 000038317 and the Certification Date range is 1/11/2018 - 1/11/2020 and the Call Date I am interested in was on 1/1/2019 which is in between the date range. If I create a query that just uses the AllEmployees and ECITOfficerCertification (lines 23-25) (the image below has INNER JOIN but the results are the same if I change that to LEFT OUTER) I get the results I am expecting. 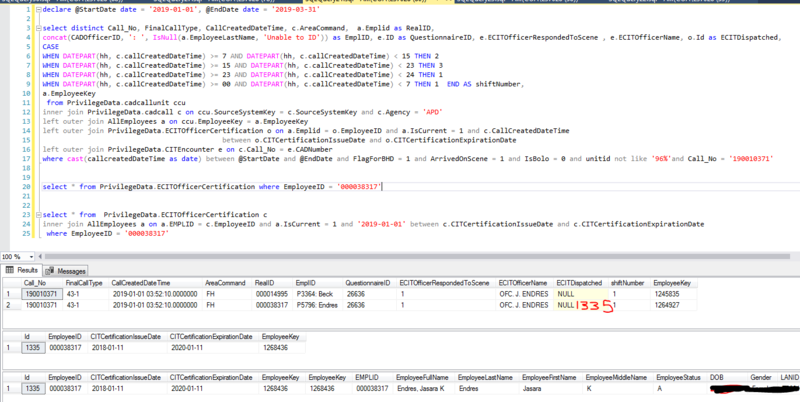 Does anyone see what is wrong that I am not getting the Id field in the first query? I have looked at it so much, I'm cross-eyed! I have a table-valued function where there are multiple tables being declared and finally joined together to create the final table with data from each table. I had a problem with duplicates so I created a new table @ORDERHEADER so select the distinct values and then insert it into the the table and eventually the final table. When I run the select distinct by itself, it populates correctly but when I run it with the insert nothing populates. Below is the code I am currently working with (I kept the commented out lines for you to see what I have tried -- above the first "--LEFT OUTER JOIN" is my working code). I've read AWS Guide about create a Modeling Relational Data in DynamoDB. It's so confusing in my access pattern. 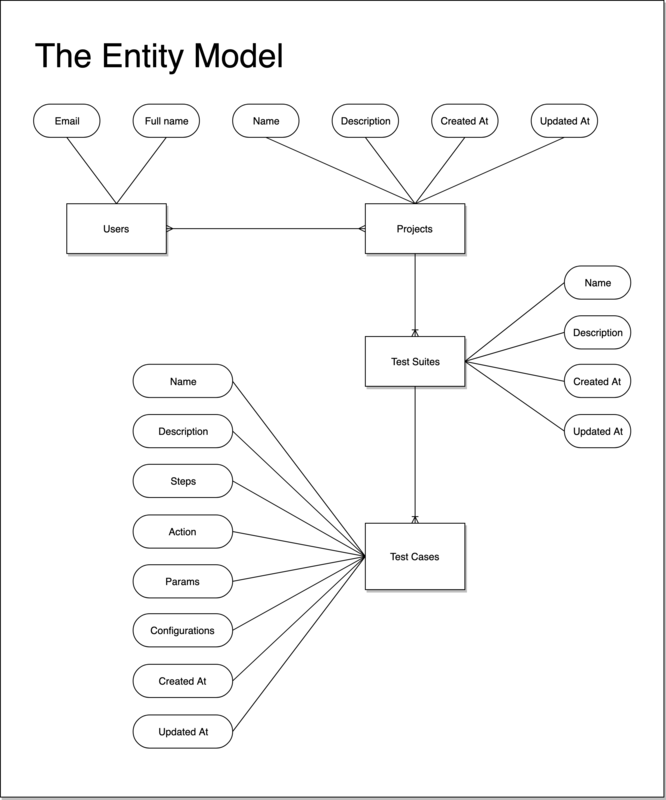 So, I model a relational entity data as guide. If I just have UserID and TestCaseId as a parameter, how could I get TestCase Detail and verify that UserId has permission. I might not be understanding the 'start with..." and "connect by..." and hope it's an easy fix. Thanks in advance! When I run the function data.tree::FromDataFrameNetwork(df) with df having around 10000 rows and 15 levels, it is throwing below error. But when I run the same function with the subset of the data (df) having 100 rows and 3 levels, it is working fine. Is there any work around to get the desired tree using this function for around 10000 rows of data with 15 levels? or is there any way to optimize the function? I have also tried manually creating the pathStrings using below code but the pathstrings/paths created were wrong. Any comments or suggestions are greatly appreciated. Thank you.